Hot off the runways, a lot of our favorite New York Fashion Week hairstyles seem rather unobtainable. But, guess what? They aren’t! Some are actually incredibly easy to recreate – and implement – into our normal, everyday non-model lives! The best news? This look is super easy to recreate! 1. Apply Alterna Bamboo Volume Uplifting Root Blast all over the roots of damp hair. 2. Pull Alterna Bamboo Volume Weightless Whipped Mousse through the hair strands to the tips. 3. Blow dry with finger tips in an upward motion to create volume from the scalp. 4. Divide hair into 1” sections, spray each section with Alterna Caviar Working Hairspray, and create waves using a wide barrel curling iron. 5. Brush through waves using a wide tooth comb to break them up into a bouncy, natural look. And you are done! Wig Designer Flora Shepelsky teamed up with New York Fashion Designer Norisol Ferrari to create the wigs that the models wore on the runway. Renowned for her signature styles, Flora creates hair enhancement solutions using all natural virgin European hair. Check out this image of a model wearing one of Flora’s wigs. This is a simple style that anyone can wear – a low bun. That is always chic! 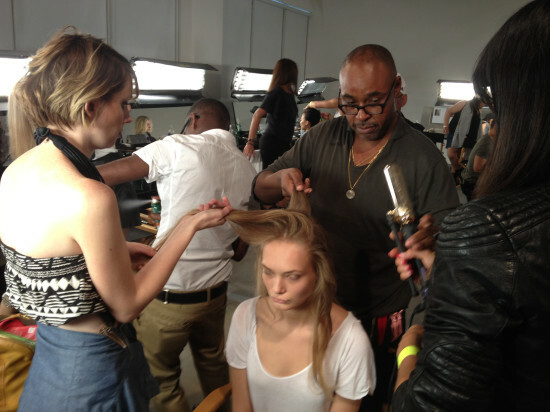 Nelson Vercher of the Rita Hazan Salon styled the hair backstage at Costello Tagliapietra. The inspiration was an 18th century painting of women with curly hair – brushed through, frizzy yet soft, natural edgy beauty. Our inspiration? Simply romantic hair. Not in the typical pretty way, but more edgy with texture. Try a multi-textured look combining straight and frizz (or dull and polished) hair into a single style. It is a perfect spring/summer look because you don’t have to worry about humidity!